Not quite long, WhatsApp launched its message delete/revoke feature which gives users the chance to delete a message after it has been sent already. As at the time of launching the feature last year, a user can only delete messages within 7 minutes after it has been sent. Fortunately, WhatsApp increased the time limit of deleting sent messages up to 1 hour. It was great to feature after it was introduced and was welcomed by all. However, with time, some people began to misuse the feature. 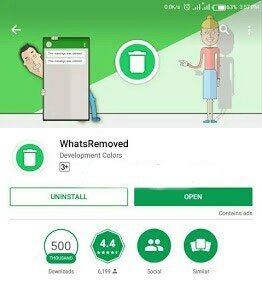 In this post, I will show you how to recover deleted WhatsApp messages using the WhatsRemoved app. WhatsRemoved - How it Works. Consequently, when a message gets deleted on WhatsApp, the recipient and the sender will see a “this message was deleted” quote instead of the originally sent message. This means both parties will not be able to see the deleted messages ever again. Interestingly, all of that has changed and you can now view deleted messages with the help of a third party app called WhatsRemoved. You don’t have to pay to use it because it’s free for download.  √ Grant the app permissions for the app installed on your phone during installation if your phone prompts you to do so. √ Now, to view, read or see deleted Whatsapp messages that were sent to you, you will need to delete the deleted message notice from your WhatsApp messenger and close the WhatsApp messenger. √ Finally, simply open the WhatsRemoved app and navigate to Chats. There you will find the deleted message(s).